The New Routemaster, is an 87 seat diesel-electric hybrid bus inspired by the AEC Routemaster buses Link originally introduced in the 1950's and finally retired from London public transport in 2005. The new bus features three entrances and two staircases with the rear stair curving around the rear from an openable 'hop-on hop-off' rear, much like the original Routemaster. The first 8 buses entered service from February 2012 on route 38 between Victoria and Hackney Marsh in time for the 2012 London Olympics. The first full route conversion took place on Saturday 22 June 2013, on the route 24 between Hampstead Heath and Pimlico. 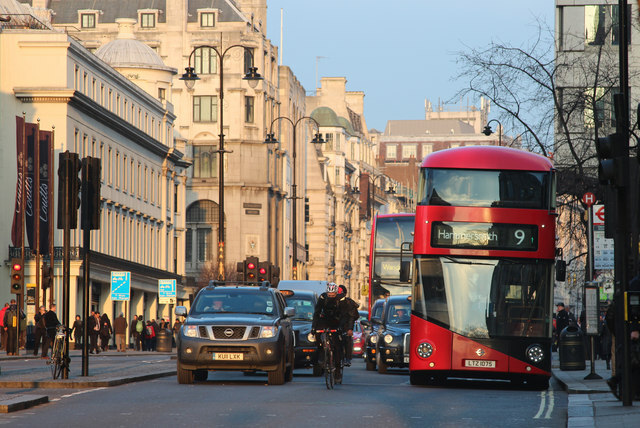 More than 600 New Routemaster buses will enter passenger service by 2016. The bus was originally referred to as New Bus for London and NBL4 and is also nick-named "Boris Bus" or "Borismaster" after Boris Johnson the Mayor of London who introduced them. 1888 puts it in the William Ewart Gladstone era; but is it he? If not, who then? There are apocryphal stories of notable Conservatives confusing the NLC for a public convenience when on their way to the House. Perhaps this is one of 'them' leaving.